By Stefano Santoni – Product & Market Manager, Wind Energy & Heavy Duty Division – DAVI. According to the report of the Global Wind Energy Council (GWEC), the global offshore wind market experienced a growth of 4.49GW of new capacity in 2018. The Global Wind Report acknowledges that nowadays there’s a total of 23GW of offshore wind capacity installed (20% more than 2017). Listening to what Ben Backwell, CEO of GWEC, said, 2018 can be considered a positive year for wind in all major markets, and China places itself as the leading power both in offshore and onshore projects. In forthcoming years, Asia is expected to be the driving region for wind development, even though this awaited growth is subordinate to an important commitment of the governments with policies fostering the projects in this field. With regards to capacity to be installed until 2023, the contribution needs to come from mature regions like Europe and USA, as well as developing markets in Asia that will have to guarantee a consistent growth. An interesting partnership has been revealed to work together in order to develop offshore wind in emerging markets. In fact, the GWEC and the World Bank Group (WBG) are going to be side by side in this effort to make emerging markets ready for new developments of wind energy. The first aim of this cooperation is to raise awareness about offshore wind opportunities in emerging markets. As a starting strategy, the idea is to gather all the stakeholders within the same network, putting together country governments, experts in the field of wind energy, commercial developers, private partners to inform them on all their options and create the perfect groundwork for new projects that could be financed by WBG and IFC. These bodies will involve both public and private partners to carry on technical studies and give life to strategies at national level in order to facilitate the development of offshore wind. To share knowledge and raise awareness in emerging markets, the two bodies will have representatives of the counterpart sitting at their table in order to favor the diffusion of best practices. “Offshore wind is a clean, reliable and secure source of energy. We have seen it work in Europe: we can now make use of global experience to scale up offshore wind projects in emerging markets”, said Riccardo Puliti, Senior Director and Head of Energy and Extractives at the World Bank. The WBG believes in fact that USD 500 billion will be invested in offshore wind projects by 2030. This growth is a great chance for countries with strong resources, such as Brazil, Indonesia, India, the Philippines, South Africa, Sri Lanka and Vietnam. For instance, Vietnam has a technical potential of offshore wind of 309GW, South Africa 356GW and Brazil 526GW, representing a possibility for big offshore wind projects in areas with high energy demand. In this perspective of growth, all around the world there will be companies involved in the process of rolling plates for the wind energy sector (no matter talking about towers or foundations). These companies are in need of solutions and customized plate roll that allow to improve the process, save time and roll both cylinders and cones in the smoothest, most accurate and fastest possible way. 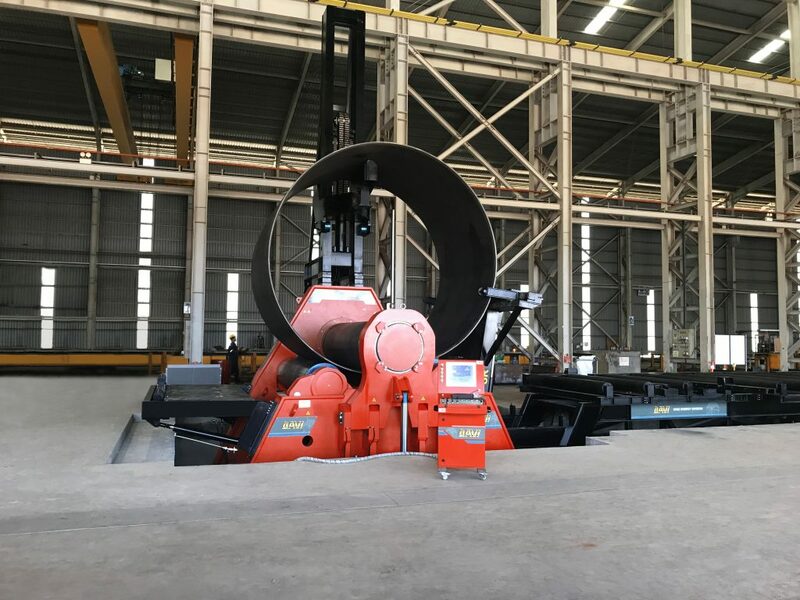 In case of large diameters components such as Towers, Transition Pieces and Monopiles, or large diameters Pin Piles for jackets, the DAVI 4 rolls plate rolling machine, along with the patented High Productivity Line, is the right answer to fulfill all the requests of this continuously more demanding market. 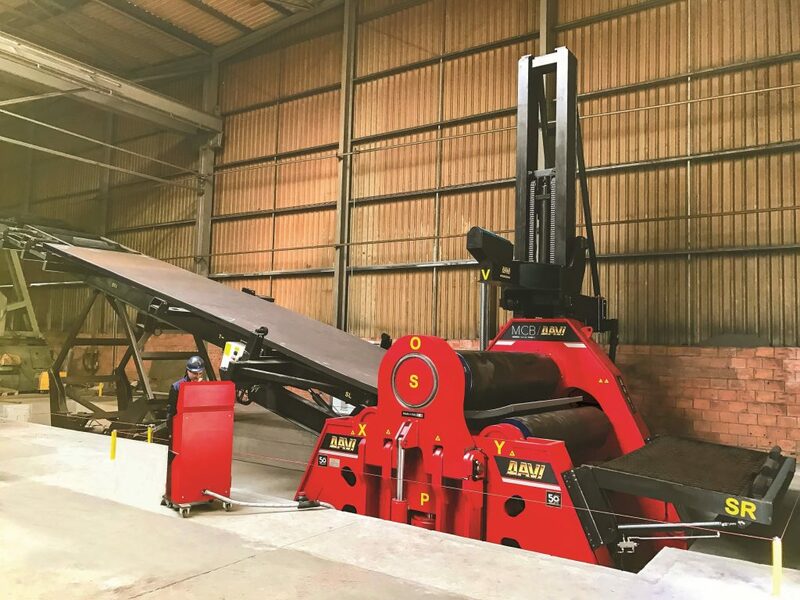 The High Productivity Line is equipped with several accessories, including a special hydraulic aligning system, which are completely managed by CNC. After inserting the geometrical dimension of the final rolled can, along with the plate material data, the patented software calculates and builds up the complete working cycle from the plate positioning and centering phase until the complete conclusion of the rolling operation. Firstly, the special positioning system, located in the infeed conveyor, allows a perfect plate positioning and squaring; it guarantees at least 50% time saving compared to standard manual system. Secondly, after an additional mechanical squaring against the rear side roll, the infeed conveyor tilts to hold the plate while pre-bending; for more accuracy and time saving the front side roll raises to bend the plate and at the same time the conveyor and the front side support rise with full synchronization in order to keep the plate perfectly aligned and on the same level. After the pre-bending operation is completed, the conveyor, the side support and the front side roll move down fully synchronized to bring the plate horizontal and ready to start the rolling phase. With this unique and patented solution, the pre-bending operation is faster, more accurate and totally safe compared to other basic solutions without a tilting conveyor. Once the plate is back in horizontal position, the exit side roll rises up to bend the plate and start the rolling phase. When the can is halfway, the overhead support automatically rises to hold the plate. At the end of the cycle, in case of thin plates rolled at very large diameters, the front side support rises up to prevent the plate collapse and overlapping, thanks to special bearing fingers that hook the plate and pull it back to keep it in a perfect round shape. Finally, the plate is fed for the second pre-bending and the plate forming operation is over. In case of cone forming, the plate rotation is automatically managed by the control system. It is done with a continuous plate rotation in case of thinner plates, while it is intermittent in case of thicker plates; however, it is fully managed through the CNC system in both cases for the most accurate and fastest cone forming process. The whole process, consisting of plate positioning, squaring, rolling, aligning for tack-welding, lasts less than 20 minutes! In particular, the tilting conveyor has many advantages, that range from single pass pre-bending to full pre-bending capacity available, from high accuracy on roundness to no need of re-rolling. But most important is the safety of the process with no risk of plate falling or non-pinching. High Productivity Line is a solution that many renowned companies have already chosen, showing how it is the best available in the market. More than 250 wind energy lines are installed all around the world, in both mature and emerging markets. From Vestas in the United States to Titan Wind in China, from Bladt to EEW and Gestamp in Europe, these are only some of the fully satisfied customers currently working with High Productivity Line for the wind energy sector. Born in Italy in 1966, DAVI is the world largest manufacturer of heavy duty plate roll, heavy duty angle roll, high productivity lines and customized rolling machines. The product portfolio includes the widest range of heavy duty plate roll (both 3 and 4 rolls); the widest range of heavy duty angle roll; high productivity wind energy lines (patented); high productivity 4 roll and robotic lines; customized machines. Note: The opinions, beliefs, and viewpoints expressed in this article do not necessarily reflect the opinions of Offshore WIND.